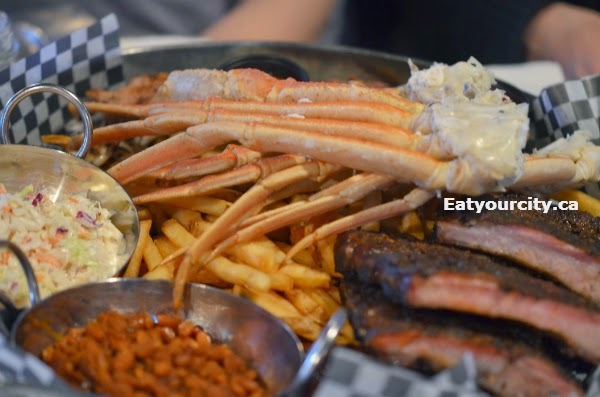 Eat Your City: Bookers BBQ Grill and Crab Shack Calgary, AB - delicious smoked ribs, chicken, brisket and snow crab! 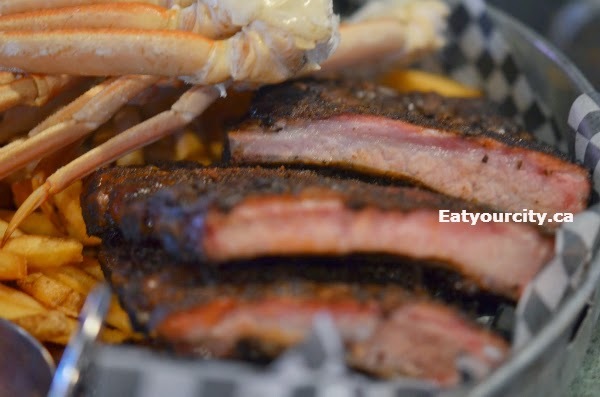 Bookers BBQ Grill and Crab Shack Calgary, AB - delicious smoked ribs, chicken, brisket and snow crab! 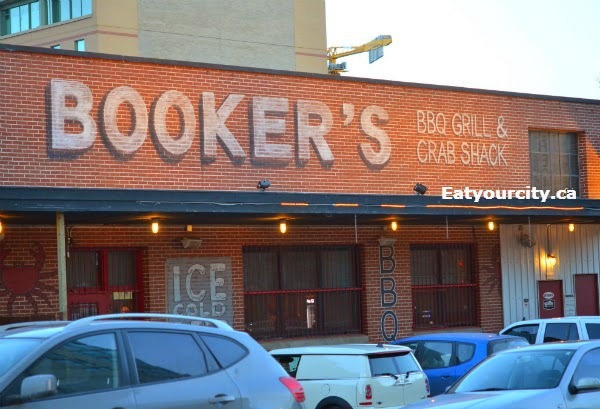 Posted by Inside this century-old brick warehouse, Bookers BBQ and Crab Shack is a hidden gem - literally and figuratively... driven by this place countless times over the years and we tried them a while back to celebrate my boyfriend's brother's birthday with Southern cooking. There's live music every Friday and Saturday night and the place was packed and hopping when we arrived.. its a darn good thing we had reservations! Here's what you look for - there's usually parking in the area if you're lucky! And a stuffed Mardi Gras beads decked alligator/croc? head lol! Service was a bit on the slow side and wait staff were either inattentive or distracted so if your requests for drinks etc dont' show up, ask again, as this place is busy so perhaps requests are getting lost in translation. One of our table was battling off a bad cold and loved the Creamy crab and sweet corn chowder. It was loaded up with blue crab chunks, sweet corn and bacon. 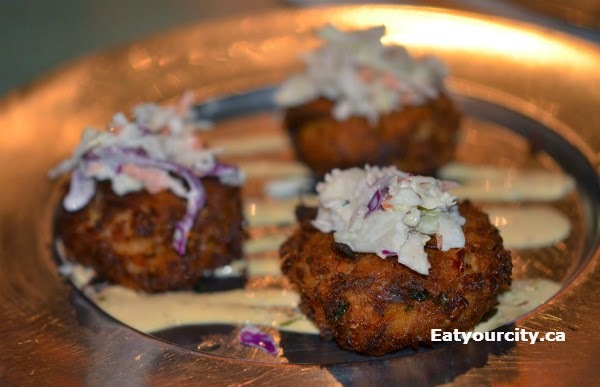 With only 3 crab cakes an order, we ordered a few Crab Cakes to share. Loaded up with generous amounts of crab, sweet bell peppers, and corn sitting on a bed of jalapeno mayo, these little tasty babies disappeared like magic. 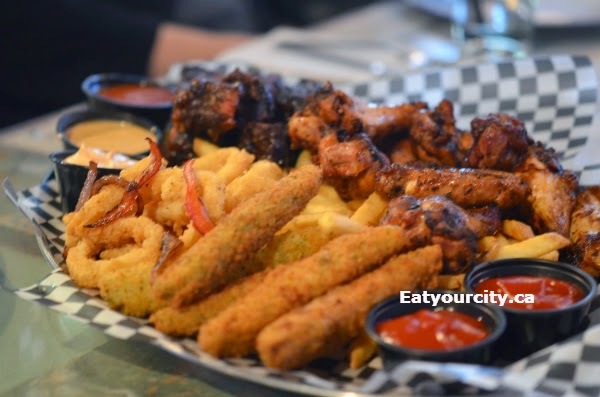 We also had an Appetizer Platter, perfect for a large group as it was a huge platter of smoked pork ribs, smoked wings, deep fried pickles, calamari and fries and plenty of dipping sauces - we had fun trying to guess which ones were which as we got them all mixed up as we passed the food around. 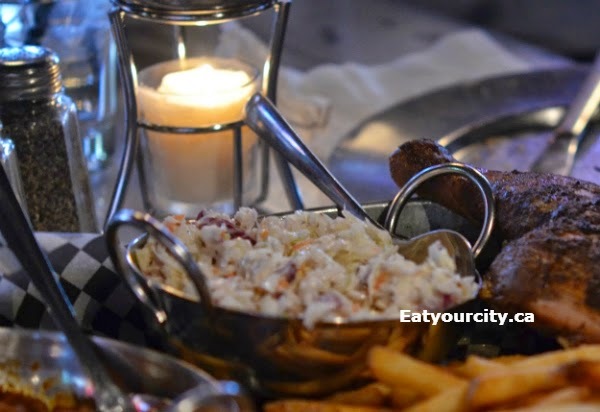 The smoked wings were fantastic - just a light hit of smoke, they were nice and juicy when you bit into them and the fries were quite tasty.. we finished them off with the dipping sauces. 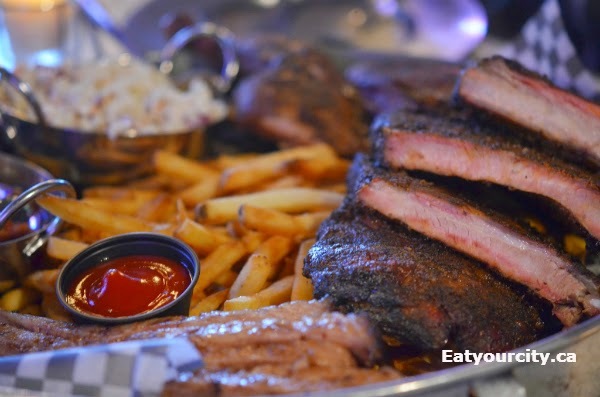 And the ribs disappeared the fastest - they were super tender - not quite fall off the bone, had a lovely smoke ring and a flavorful bark... we were glad we ordered more in our entrées selection! Chef Myles Learning makes some mean Southern style BBQ items and since we were a large group, we were able to try a good chunk of the hefty menu! 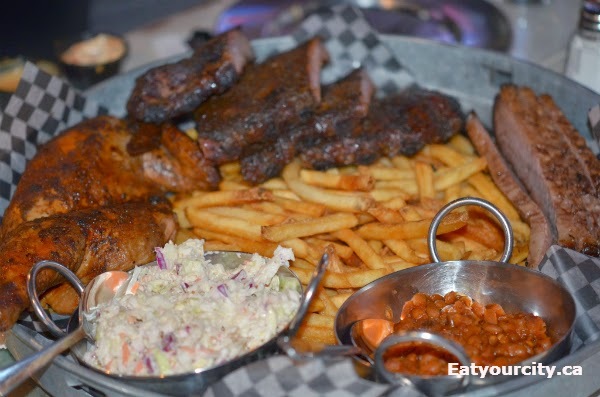 First up was the BBQ Platter. 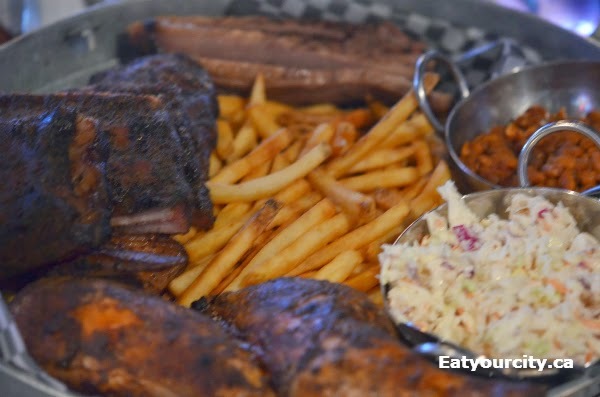 Its a metal garbage can lid (clean and lined) and its practically overflowing with smoked pork ribs, smoked brisket, smokehouse chicken, baked beans, coleslaw and fries. The smoked brisket was a touch on the dry side (may have been an off night) but flavorful and tasty none the less, while the smokehouse chicken shined as it was juicy and had just the right amount of smoke you just wanted more and more after sinking your teeth into it... we had to ask a few times for extra utensils (waitstaff are a bit distracted/unattentive) so we could break down the chicken into portions. And ribs - again.. awesome! Sitting atop a mountain of tasty fries was lots of snow crab legs to share. 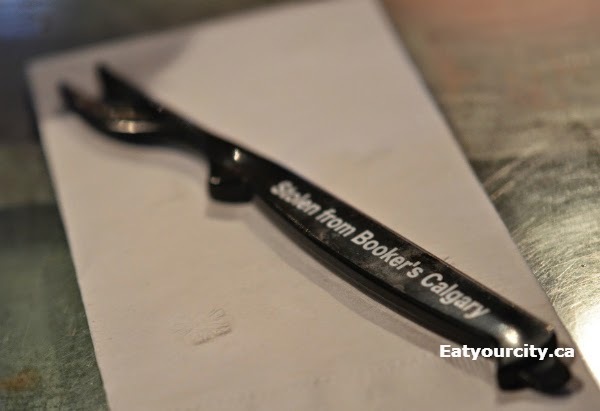 The crab legs were steamed/boiled to perfection, and teasing the sweet chunks of meat out was made vastly easier with these little doodads they provide at the table. We had some sides as well - the Baked beans were yummy - hit of sweetness to balance out the savory and the beans still had a bit of bite to them and not mushy. 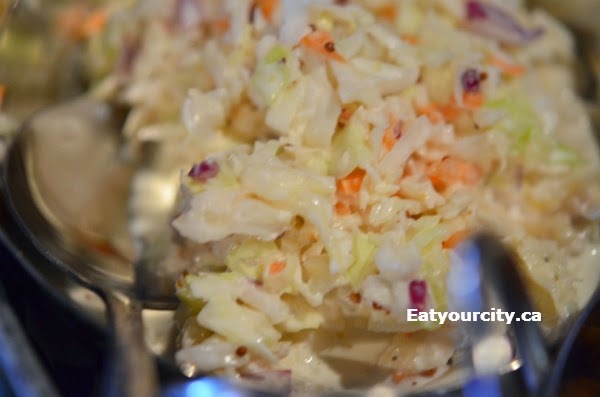 The coleslaw was refreshing and delicious - while creamy, it somehow was light and refreshing on the palate and a great way to help balance out all the meaaaaaaaaat we were eating. We we all piled out the door with full tummies and leftovers, its apparent the huge huge huge platters at Books BBQ have bested our groups combined stomach realty space. Service is hit and miss, but hopefully that will improve in time. We went home to have cake as fellow patrons continued to drink and eat into the cool fall night.